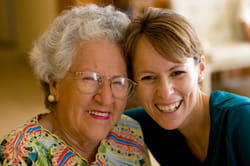 More than three-quarters of families choose to care for their relative with Alzheimer's at home. Studies have shown that this care reduces the patient's behavioural disorders and delays the need for alternative accommodation. Carers of patients with Alzheimer's disease work 24 hours a day, 365 days per year, often having to adapt to varied and unpredictable behaviour. If you are a carer, you can feel overworked, and are at risk of developing exhaustion, depression, sleep disorders or family difficulties. Relatives/carers may feel undervalued, inefficient and guilty. Respite is vital for patients and their family carers. It is encouraged so that you "can breathe", and are able to go on holiday, and take care of yourself, so that you can return rested and re-motivated. Respite care can be provided in many ways. There are day centres where patients/relatives can be accommodated for part of the day every week. Also, there are the options of rehabilitation centres or retirement homes which can provide longer term care for a several weeks. Latest update on May 28, 2010 at 11:32 AM by N.T. This document, titled "Supporting carers," is available under the Creative Commons license. Any copy, reuse, or modification of the content should be sufficiently credited to CCM Health (health.ccm.net).